Home > Safety & Environmental Help and Guidance > Environmental Noise > Sound Meters – How often should my Sound Meter be Calibrated? It’s well known that Sound Meters inevitably need to be calibrated to keep performing accurately, but a question we’re often asked is, “How often does my Sound Meter need to be Calibrated by a calibration lab?“. Answering this question is both easy and a not so easy, dependant on a few factors. it’s then appropriate to calibrate your equipment more frequently. – Instrument specifications and manufacturer’s instructions – What does the manufacturer recommend. – Any requirements of the test specification – Does the application specifically define a maximum calibration period. – Expected use of the equipment – heavy use or harsh environments should shorten the calibration period. – Review of calibration history – The calibration period should be reviewed and changed if necessary; a history of stable results may increase the period. – Reference to the maximum period recommended in the table at the back of the LAB23 document depending on the type of equipment used. There is one further point that you should consider and that is whether you are ever likely to have to rely on your measurements in court in defence of a noise induced hearing loss claim. In this case, all equipment should be calibrated at least annually. You won’t find this point in any UKAS guidance, but is just something we have learned first hand with our experience of mitigating noise induced hearing loss claims. As you can see, the general statement that equipment is okay to be calibrated every 2 years largely isn’t true, so you should be aware that this should at very least be reviewed regularly! And please don’t forget that a proper calibration is not just a few points checked with an acoustic calibrator – we are talking about a full check of the electrical performance of the equipment at multiple points of frequency and level without the microphone fitted, followed by acoustical checks also at multiple frequency and level points, with the microphone included as part of the system – beware ‘cheap’ calibration houses as you will get what you pay for! 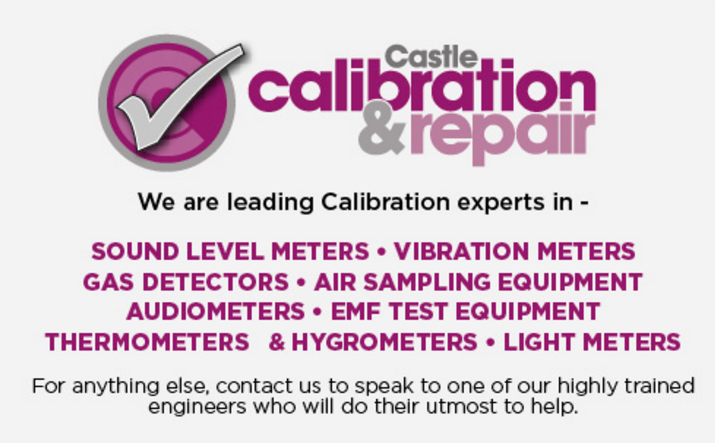 For a professional Calibration and Repair Laboratory offering a first class service with fast turnaround and affordable pricing, choose Castle Calibration. At www.castlecalibration.com you can find out pricing and build your own calibration quote online. Contact us on 01723 584250 to speak to an expert.